Angelina Jolie wears her engagement ring as she and fiance Brad Pitt and their son Pax view works from the Los Angeles County Museum of Art's Chinese collection on Wednesday, April 11. Angelina Jolie and Brad Pitt are engaged to marry, a spokeswoman for Pitt said on Friday. "Yes, it's confirmed. It is a promise for the future and their kids are very happy. There's no date set at this time," Pitt's spokeswoman Cynthia Pett-Dante told Reuters. Pitt, 48, and Jolie, 36, have been a couple since 2005, and are raising six children together, but until now have said they had no plans to marry. But Jolie was photographed at a Los Angeles museum this week wearing a large diamond ring on her engagement finger that Pitt had helped to design. Jewelry maker Robert Procop said he had fashioned the ring in collaboration with Pitt, specifically for the actress. "The full creative journey - from conception to completion - took a year, with Brad Pitt waiting until the perfect moment to unveil this special jewel to Angelina Jolie," Procop's spokeswoman said in a statement on Friday. The couple, dubbed Brangelina by celebrity media, have previously resisted pressure to marry, despite numerous reports over the years that a wedding was in the offing. Pitt, the star of "Moneyball", said some years ago they would not wed until gay marriage was legalized in the United States. But in January he was quoted as saying that the pair were coming under pressure from their three adopted and three biological children. The two actors (and their growing family) travel the world for worthy causes. When Angelina Jolie and Brad Pitt aren't busy making movies or taking care of their growing brood of children, the Hollywood power couple volunteers and donates millions to a number of causes around the world. 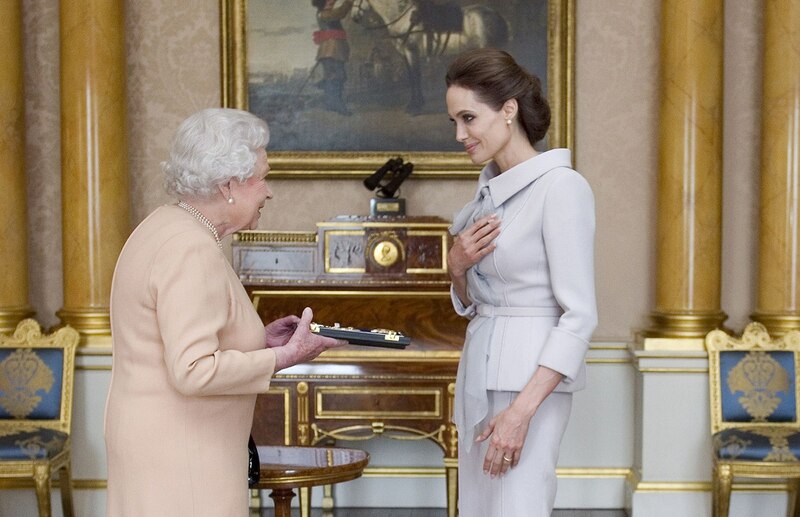 Angelina Jolie is presented with the Insignia of an Honorary Dame Grand Cross of the Most Distinguished Order of St. Michael and St. George by Queen Elizabeth II at Buckingham Palace on October 10, 2014. Jolie was awarded an honorary damehood (DCMG) for services to U.K. foreign policy and the campaign to end war zone sexual violence. 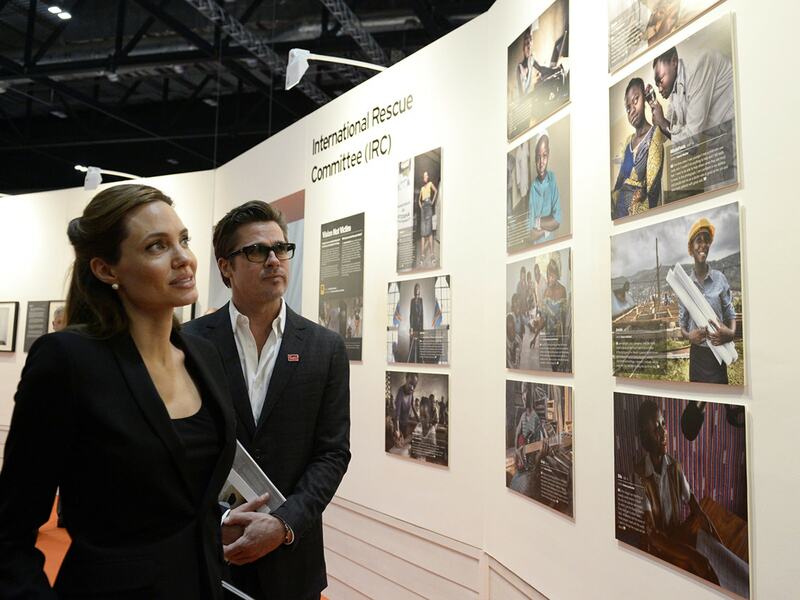 UN Special Envoy and actress Angelina Jolie and actor Brad Pitt look at photographs during the Global Summit to End Sexual Violence in Conflict at ExCel on June 13, 2014 in London, England. Angelina Jolie sports an engagement ring as she, Brad Pitt and their son Pax view works from the Chinese collection at the Los Angeles County Museum of Art on April 11, 2012. Pitt’s manager confirmed their engagement on Friday, April 13, 2012. 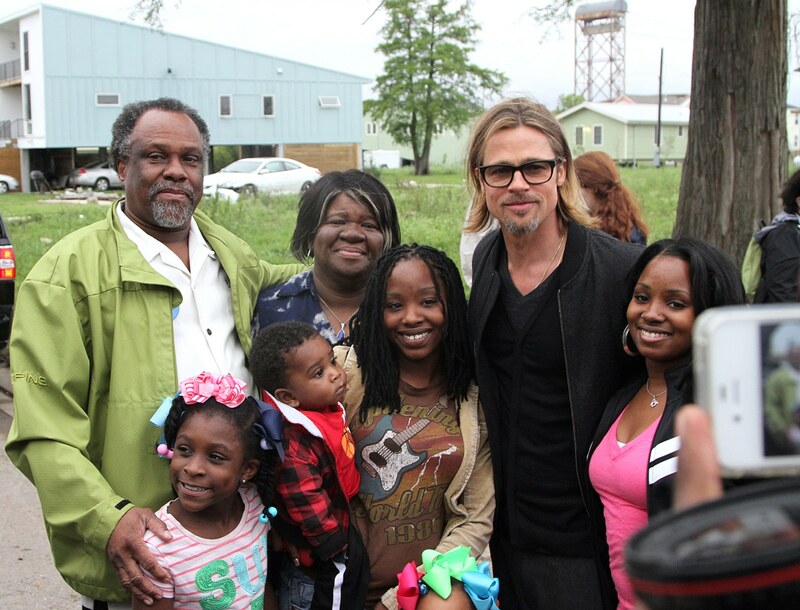 Pitt poses for a photo with a Make It Right family during a visit in the Lower 9th Ward in New Orleans, on Mar. 9, 2012. Make It Right is an organization helping to rebuild the part of the city hardest hit by Hurricane Katrina. Pitt and Kevin Bacon speak onstage during the one-night reading of "8," a play about marriage equality presented by the American Foundation For Equal Rights & Broadway Impact in Los Angeles on March 3, 2012. Jolie and Pitt attend the Cinema for Peace Gala ceremony at the 62nd Berlin International Film Festival in Berlin on Feb. 13, 2012. Brad Pitt and Angelina Jolie arrive at the Screen Actors Guild Awards in Los Angeles on Jan. 29, 2012. Jolie and Pitt look elegant at the Golden Globe Awards held at the Beverly Hilton Hotel in Beverly Hills.on Jan. 15, 2012. Jolie and Pitt meet with President Barack Obama at the White House in Washington on Jan. 11, 2012. Pitt and Jolie visit Con Dao prison off Vietnam's southern coast, Nov. 13, 2011. Jolie and Pitt adopted a Vietnamese boy in March 2007. 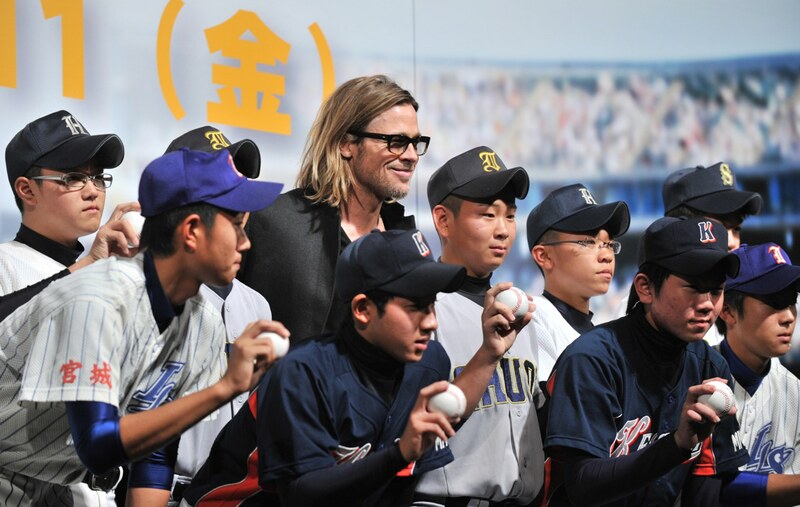 Pitt and young Japanese baseball players from the area stricken by the March 11 earthquake and tsunami disaster, pose for a photo during the Tokyo premiere of his film "Moneyball' on Nov. 9, 2011. Accompanied by their six children, Pitt and Jolie appear before photographers upon their arrival at Haneda Airport in Tokyo on Nov. 8, 2011. Jolie visits Libya to help agencies bringing aid to Libyans in Tripoli and Misrata on Oct. 11, 2011. The two-day trip was Jolie's first to Libya, but she previously visited Libyan refugees in Malta and on the Italian island of Lampedusa in June, and went to Tunisia in April to appeal for international support for people fleeing the revolution there. When Jolie and Pitt aren't busy making movies or taking care of their growing brood of children, the Hollywood power couple volunteers their time and donates millions of dollars to a number of causes around the world. In June 2011, Jolie visited refugees who have fled their countries and are now living at a detention center for asylum-seekers in Malta. Jolie, a goodwill ambassador for the United Nations, visits Somali refugees in a Tunisian refugee camp in June 2011. According to Tunisian authorities, more than 200,000 have fled violence in Libya to come to Tunisia. 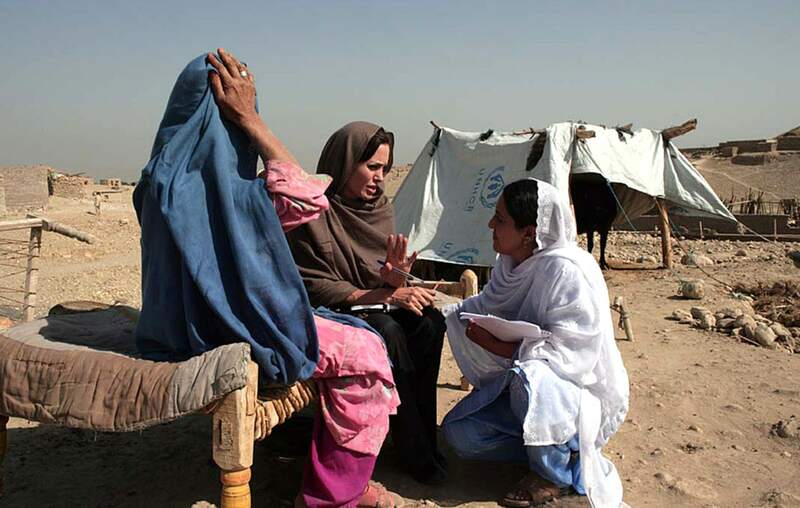 Jolie talks with a flood-affected woman during a visit to a camp for people displaced by heavy floods in Nowshera, Pakistan, on Sept. 7, 2010. Here Jolie visits a daycare center run by the Women's Federation of Sucumbios province in northern Ecuador in June 2010. The Federation provides women who are victims of violence with a shelter, offers them psychological support and facilitates their integration with income-generating projects. Jolie and Pitt visit the village of Medjedja, 43 miles east of Sarajevo, in April 2010. The Jolie-Pitts flew into Bosnia on a surprise visit to meet refugees still suffering from the brutal 1992-1995 civil war. Jolie talks to a 10-year-old Haitian boy who lost a limb during the January 12 earthquake as she visits the MSF Hospital on February 9, 2010 in Port-au-Prince, Haiti. Jolie, son Maddox Jolie-Pitt and Pitt are seen leaving Super Bowl XLIV at Sun Life Stadium on Feb.7, 2010 in Miami Gardens, Fla. The couple cheered on the New Orleans Saints, since they have a house there and have worked to build new environmentally friendly homes in the area. As a UNHCR Goodwill Ambassador, Jolie attends the 2009 World Refugee Day at National Geographic Society June 18, 2009 in Washington, DC. Jolie paid tribute to the 10.5 million refugees now recognized by the Commission. The UNHCR announced that she and her partner, Brad Pitt, have donated $1 million to help Pakistanis displaced by fighting between troops and Taliban militants. Pitt and Jolie arrive on the red carpet for the screening of Pitt's film "Inglourious Basterds" by director Quentin Tarantino at the 62nd Cannes Film Festival May 20, 2009. Brad Pitt poses Dec. 1, 2008 for a photograph in Kellogg Park, a technologically advanced playground in the Lower 9th Ward that uses solar energy to run its electronic wireless game system in New Orleans. The playground sits among homes being built through Pitt's Make It Right Foundation. In October, 2008, three months after giving birth to twins, Jolie, goodwill ambassador for the United Nations High Commissioner for Refugees, traveled to Afghanistan and met with returnee women in Nangarhar province. Pitt and Jolie, shown attending a screening of "Changeling" on Oct. 4, 2008 in New York, announced in September that they were donating $2 million to help fight HIV/AIDS and tuberculosis in Ethiopia. The money will be used to build a center, named for their 3-year-old daughter Zahara, who was born in that country. 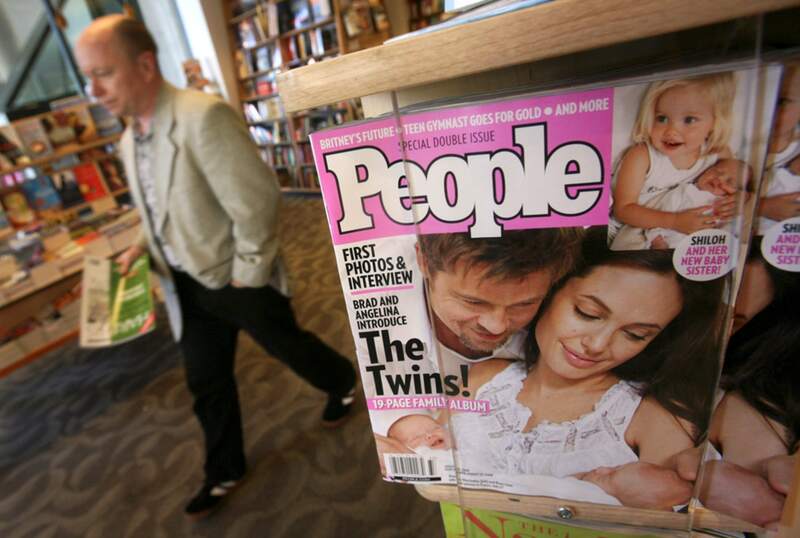 In August, 2008, People magazine reportedly paid $14 million for the first photos of their newborn twins. The money will go to a foundation created by Pitt and Jolie that largely focuses on helping children around the world. In 2006, according to the Huffington Post's examination of federal tax filings, the couple donated $8 million, with Pitt putting in $4,402,317, and Jolie donating $4,123,613. 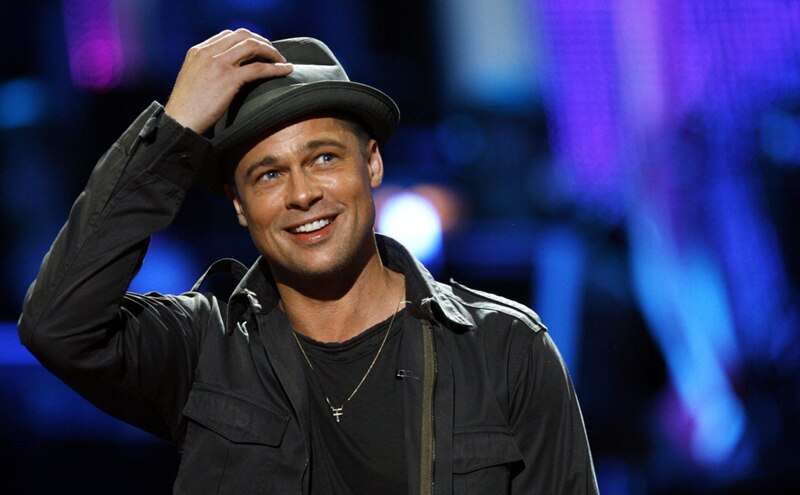 Actor Brad Pitt salutes fans at the "Idol Gives Back" show at the Kodak theatre in Hollywood, California April 6, 2008. The "American Idol" special charity event benefits relief programs for children and young people in extreme poverty. According to "Idol Gives Back," more than $64 million has so far been allocated from the event. In its two years in existence, the special has raised more than $140 million. 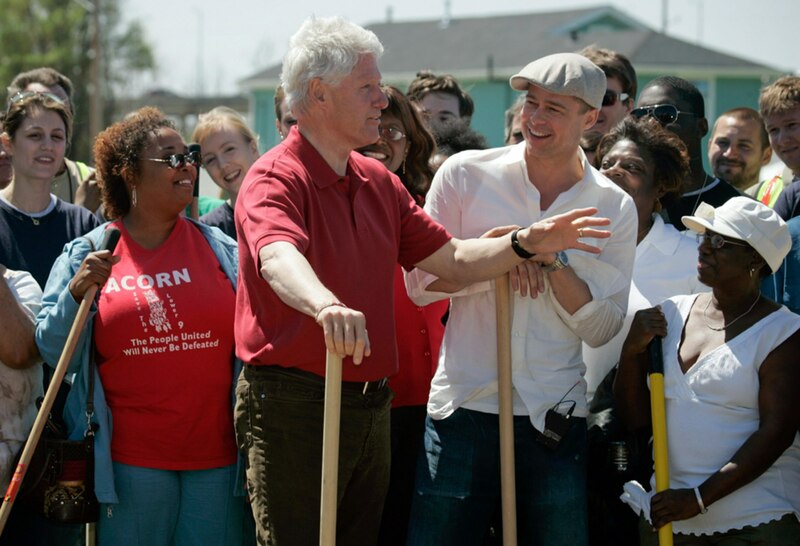 Former U.S. President Bill Clinton, left, speaks as actor Brad Pitt, right, as community members, and volunteers look on during a groundbreaking ceremony for Pitt's Make it Right house construction project in the Lower Ninth Ward of New Orleans March 16, 2008. During a visit to Baghdad in February 2008, Jolie had lunch with with U.S. Marine Corporal Christopher Lewis, and met with U.S. General David Patraeus, and Iraqi Prime Minister Nouri al-Maliki. Jolie's visit, in her capacity as an ambassador for the UN High Commission for Refugees, was intended to help increase assistance efforts with displaced Iraqis. Jolie has joined with The Children's Health Fund to find ways to help the reportedly thousands of displaced children who are showing mental and physical problems likely due to hurricanes Katrina and Rita. 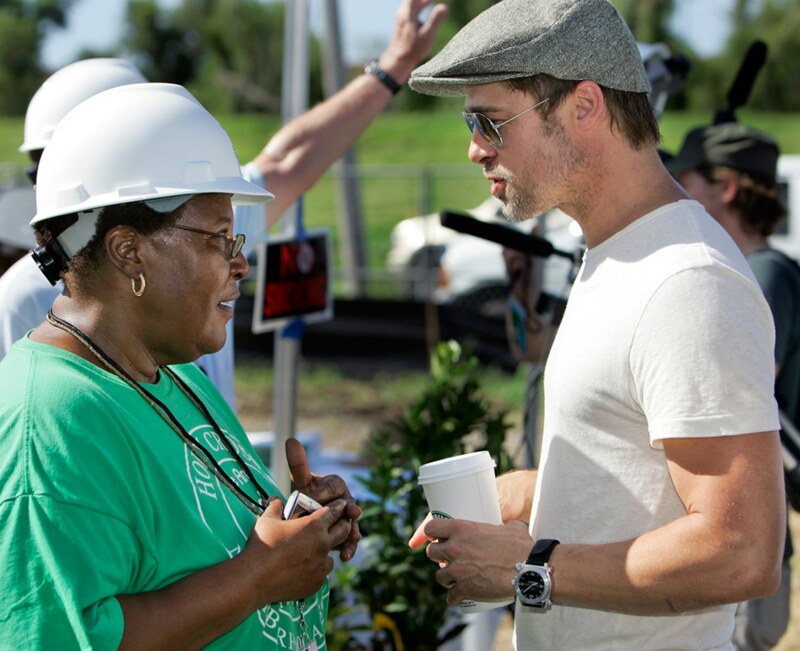 The couple visited New Orleans just before Christmas in December, 2007, when Pitt urged Americans to donate to the home-building effort. Each actor earns millions at the box office -- enabling them to give millions away to good causes. Here they arrive for the premiere of Pitt's "The Assassination of Jesse James by the Coward Robert Ford" at the 33rd Deauville American Film Festival on Sept. 3, 2007 in Deauville, France. Jolie meets with an elderly refugee at the makeshift Al Waleed camp in Iraq in August, 2007. The woman, as well as an estimated 1,300 other people, were unable to leave the country for neighboring Syria. 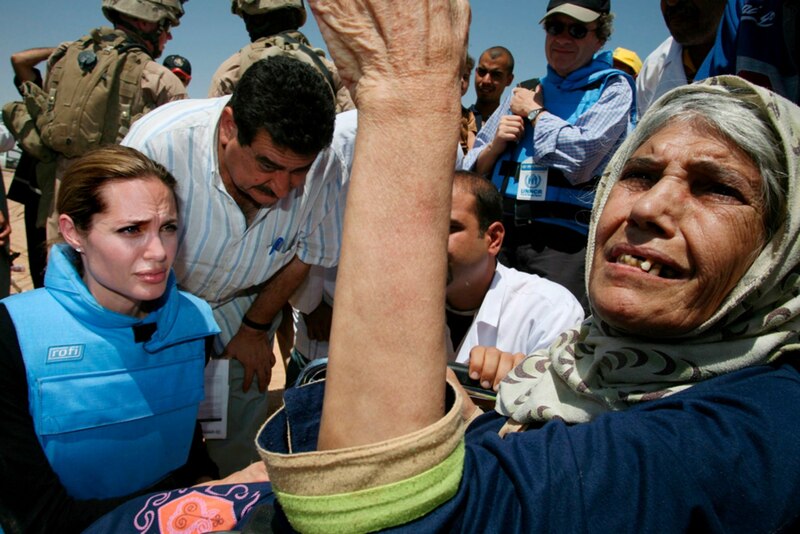 Jolie spent two days in Iraq and Syria, seeing first hand the plight of four million people uprooted by the ongoing conflict in Iraq. Lower Ninth Ward resident Pam Dashiell, talks with Pitt before a news conference with Global Green USA at a environmentally friendly house under construction in New Orleans in August, 2007. Dashiell served on the committee that judged the designs for the houses. The Jolie-Pitt Foundation donated $100,000 to the organization in 2006. In May 2007, Jolie and Pitt enjoyed an intimate dinner in Prague, where Jolie filmed a role in "Wanted," a comic book adaptation. While there, the couple announced that they were donating $1 million from their Jolie-Pitt Foundation to groups assisting more than four million people affected by the crisis in Darfur. In April 2007, Jolie participated in the Global Action For Children (GAC) press conference in Washington, D.C. The organization supports orphans and vulnerable children and helps provide free schooling in developing countries. At the conference Jolie said: "In many ways it is better to think of these children one by one -- each deserving of our care and attention, each being of equal value, and each being a test of whether justice -- or injustice -- will prevail." In March 2007, Jolie carried her newly-adopted son, Pax, then 3, on to a plane at Noi Bai airport in Hanoi. The Vietnamese boy's name means "peaceful sky" -- "pax" means peace in Latin and "thien" translates to "sky" in Vietnamese. According to Reuters, the actress left a note in the visitor’s book of Tam Binh orphanage: "Thank you for taking such wonderful care of my son. I am sure he will miss your beautiful, caring staff as much as you will miss him." In March, 2007, Pitt and Jolie took their two young daughters, Zahara and Shiloh, for a walk in the sunshine in the French Quarter of New Orleans. 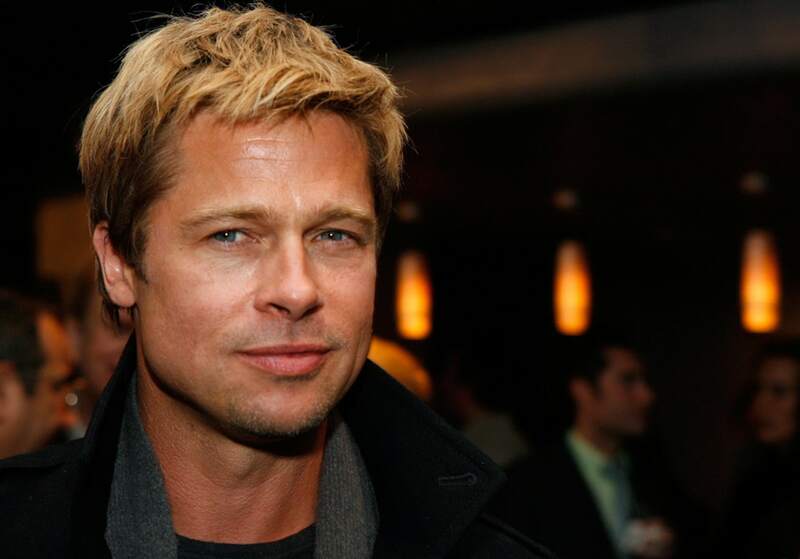 Pitt first fell in love with the Big Easy in 1994 when he was filming “Interview with the Vampire” there. In 2007 he and Jolie purchased a home in the French Quarter while he was filming “The Curious Case of Benjamin Button,” and they’ve made the city their part-time home. Just days after the couple attended the 64th Annual Golden Globe Awards in Beverly Hills on Jan. 15, 2007, Jolie's mother Marcheline Bertrand died of ovarian cancer at the age of 56. In 2001, Jolie and Bertrand, who had Iroquois ancestry, helped establish the All Tribes Foundation to support the cultural and economic survival of native Americans. In Jan. 2007, Pitt attended the Newmarket Films after-party in West Hollywood, Calif. for the premiere of "God Grew Tired of Us," for which he served as an executive producer. Jolie joined him at the party for the documentary, which followed four Sudanese boys who escaped their war-ridden homeland to travel to America. 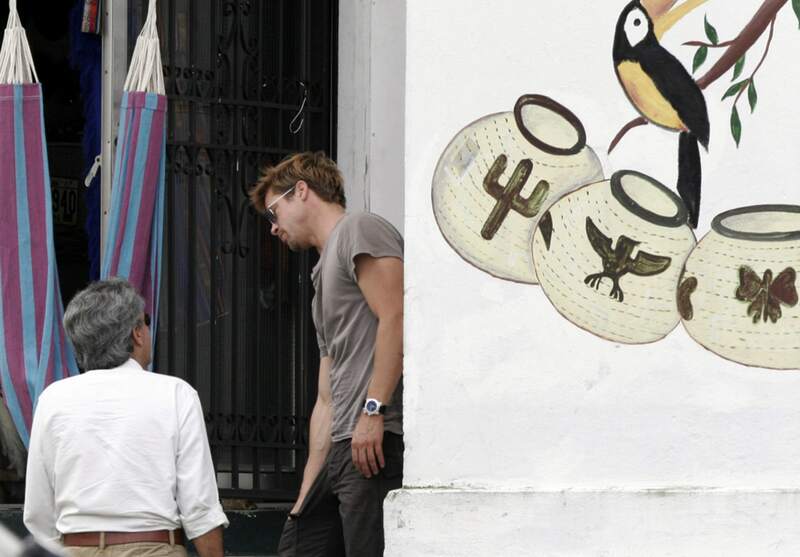 Pitt talked with an unidentified man outside of a handicraft market in Panama City on Dec. 29, 2006. 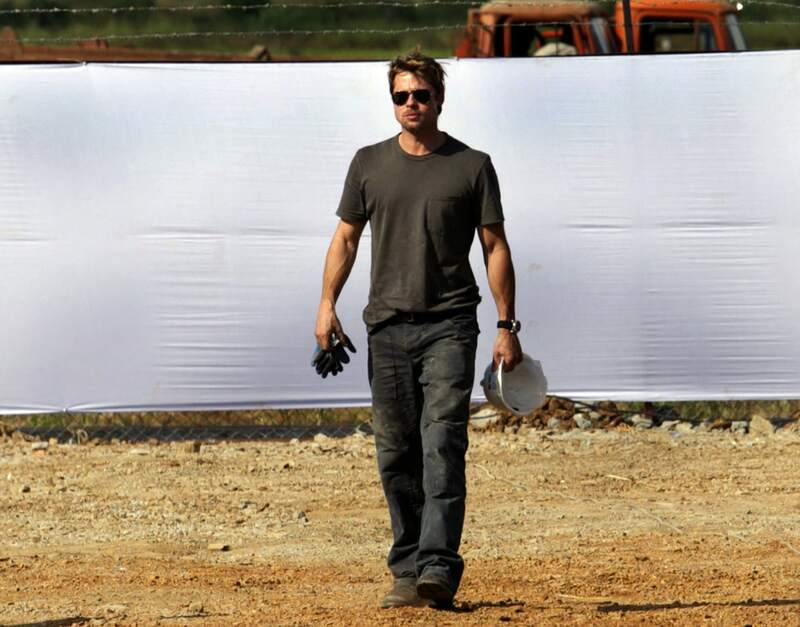 Besides touring the capital, Pitt and Jolie visited a former U.S. military base and the construction site of Panama's new Biodiversity Museum, designed by Frank Gehry, at the entrance of the canal in the Amador district. Jolie and Pitt (not pictured) met a Colombian refugee family in San Jose, Costa Rica, on Chrismas Day 2006. The actors spent the holiday with Colombian refugees in the Costa Rican capital. Costa Rica is the home for some 11,500 refugees, most of them Colombians. Pitt and Jolie spent Thanksgiving 2006 cruising on a motorbike, while touring Ho Chi Minh City, Vietnam. Prior to arriving in Vietnam, the couple made a surprise visit to Cambodia where they visited a former Khmer Rouge death camp, now a genocide museum. Through their Jolie-Pitt Foundation, the couple has donated one million dollars each to Global Action for Children and Doctors Without Borders. The couple's contributions also include $100,000 to the Daniel Pearl Foundation, in memory of the slain Wall Street Journal reporter. Jolie starred in "A Mighty Heart," based on Mariane Pearl’s memoir about her husband’s kidnapping and murder. Here they walk in Mumbai, India, on Nov. 12, 2006. They lived in India during filming of the movie, which Pitt co-produced. Pitt pitched in to work with former president Jimmy Carter at the 23rd Jimmy Carter Work Project in Patan village, southeast of Mumbai, India, on Nov. 1, 2006. The project buillt 100 homes in a week for the underprivileged. Pitt helped put a roof on one of the houses with other volunteers. In Jan. 2006, Pitt accompanied Jolie to the World Economic Forum in Davos, Switzerland. Jolie told business leaders to "stay focused on the issues." She urged them to "follow up on Darfur, to watch what is happening in the courts, to follow up on Nepal ... and on Afghanistan." In Nov. 2005, Brad Pitt and Jolie (pictured here on Nov. 27, 2005, with Maddox and newly-adopted daughter Zahara, arriving at Tokyo's international airport at Narita) toured areas of Pakistan devastated by an earthquake. Jolie -- the UN High Commissioner for Refugees' goodwill ambassador since 2001 -- visited the 90% destroyed mountain town of Balakot in a "show of support for survivors of the disaster," the UNHCR said. Angelina Jolie and son Maddox were surprise guests at the Live 8 Africa Calling concert, held at the Eden Project in Cornwall, England, on July 2, 2005. Jolie, who was helicoptered in by concert organizers, was introduced to the crowd by Peter Gabriel as a great supporter of African causes. "We can fix what's happening in Africa," said the actress. "We do have the answers and the ability to stop them dying." "It (marriage) seems to mean more and more to our kids. We made this declaration some time ago that we weren't going to do it 'til everyone can. But I don't think we'll be able to hold out," Pitt told The Hollywood Reporter in an interview. "It means so much to my kids, and they ask a lot. And it means something to me, too, to make that kind of commitment ... But to be in love with someone and be raising a family with someone and want to make that commitment and not be able to it is ludicrous, just ludicrous," he added. Pitt and Jolie became close on the set of the movie "Mr. & Mrs. Smith." Pitt later divorced "Friends" actress Jennifer Aniston. Jolie, who won a best supporting actress Oscar for her work on "Girl, Interrupted" in 1999, had two previous short-lived marriages to actors Billy Bob Thornton and Jonny Lee Miller.